Residents, community members and staff celebrated the opening of Yesler Terrace Park on Saturday, August 25, with a day of fun activities, soccer and an outdoor movie. 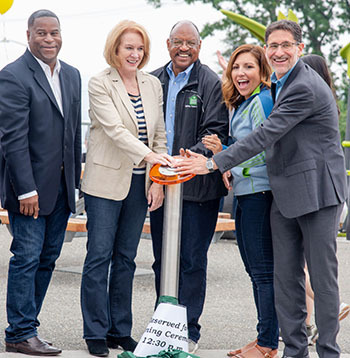 Following a dedication ceremony, Seattle Mayor Jenny Durkan, Seattle Parks and Recreation Interim Superintendent Christopher Williams, Seattle Sounders FC Owner Adrian Hanauer, Seattle Housing Authority Executive Director Andrew Lofton and Seattle City Councilmember Teresa Mosqueda pressed the button to launch spray park jets and officially open the nearly two-acre recreational area. The transformation of Yesler into a vibrant new urban community is becoming more apparent with the emergence of new housing, parks, services, community organized activities, art and transportation choices. 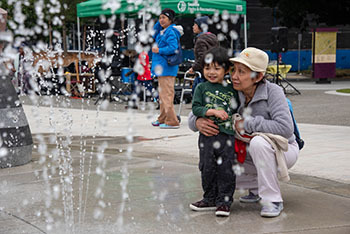 The new Yesler Terrace Park provides an important civic gathering place for residents, neighbors from the surrounding areas and visitors from within and outside of Seattle to connect with each other. The park features play equipment, a spray park, an outdoor basketball court, a soccer field sponsored by the RAVE Foundation (the official charitable arm of the Seattle Sounders FC) and other amenities.